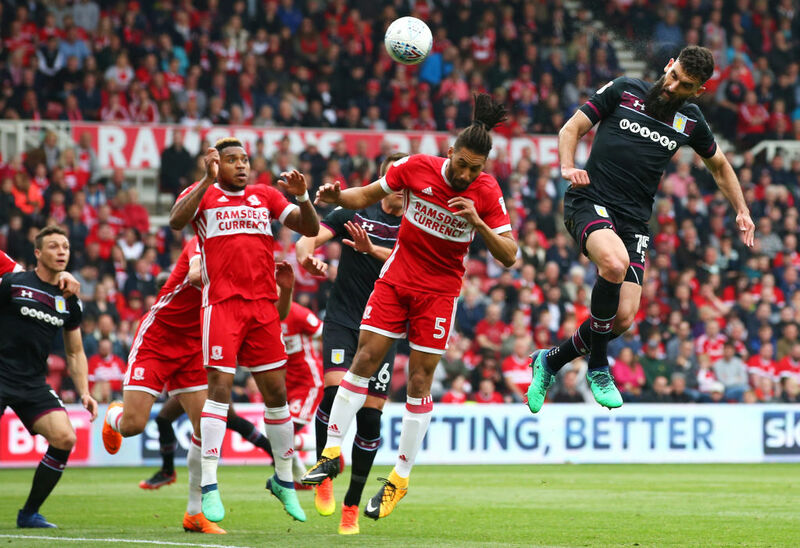 Caltex Socceroos skipper Mile Jedinak has handed Aston Villa a vital promotion play-off semi-final advantage after he scored the only goal in a 1-0 win away to fellow English Championship side Middlesbrough. Jedinak’s 15th minute pinpoint glanced header into the far bottom corner was enough for Villa to escape from the north-east with the win, while the 33-year-old also played a vital defensive role as Steve Bruce’s side earned a clean sheet. “We had to defend very well. We went too deep in the second half. But the resilience,” said Bruce at full-time, lauding the defensive efforts of his team. Starting in a team of vast experience – with Jedinak among Villa’s seven 30-somethings to start and also one of six to previously earn Premier League promotion to the Premier League – Jedinak sat as the deepest of three central midfielders in front of his back four. It didn’t take long for the Aussie to demonstrate his strength – snapping away in midfield in the opening 10 minutes to dispossess Boro’s key attackers Adama Traore and Muhamed Besic. The former Crystal Palace enforcer also added another aerial presence in Villa’s box to defend against the direct approach of a Tony Pulis side. But while Jedinak won four defensive aerial duels and pulled out five clearances – the second most in the match – it proved to be his header in the Boro box that was a game-changer. His brilliant header from beyond the near post redirected Jack Grealish’s corner into the bottom of the far post, clipping the base of the upright as Jedinak grabbed his first away goal in his last 49 away appearances at club level. Jedinak was also in the middle of Middlesbrough’s two other moments of ill-discipline, copping fouls from George Friend and Ben Gibson which saw them earn yellow cards. And as the game came to an end – with the hosts pushing for an equaliser – the Caltex Socceroos star twice hooked the ball clear from danger and won a vital tackle on the edge of his own box. It was that influence on the game which earned him an 8/10 rating by Sky Sports – second only to teammate Grealish – while the Birmingham Mail awarded the ex-Central Coast Mariners man an 8.5/10. “Introduced back into the team because of his experience, [Jedinak] defended resolutely and won so many important headers - the most vital of them all for the winning goal which he planted perfectly into the far corner,” Gregg Evans wrote. Jedinak and his side will now turn their attention to the return leg, with Villa hosting Middlesbrough on Wednesday 16 May at 4.45am AEST where the winner of the tie will play either Derby County or Fulham in the play-off final at Wembley.